In a time of divisive rhetoric and heartbreaking news stories of racial tensions in the country a book like this serves as a welcome reprieve. 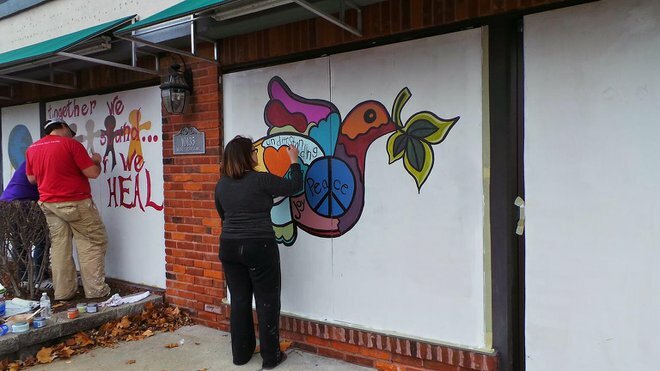 Focusing on a positive outcome of the disastrous, tragic events which occurred in and around the city in 2014, the Painting for Peace in Ferguson reminds us that love and goodness is present in even the most burdened communities. Author Carol Swatout Klein grew up in Ferguson and always dreamed of writing a picture books for kids. As a journalist she witnesses the coming together of her hometown and wanted to share the story. Told in a sing-song narrative, the text is matched with full-color photographs and shows how the community painted hundreds of boarded windows and doors, even on the city hall. Over 300 artists, volunteers, church groups and families participated. The book provides an easily accessible path to talking with their kids about the unfortunate race issues in the country and the way that we can join together to create productive dialog on the issues. *Due to the success and popularity of the initial book release, there is now a scheduled release date for an adult coloring book! Several pages are available for a free download. The website also offers teacher and parent reading tools from Kindergarten through 5th grade.